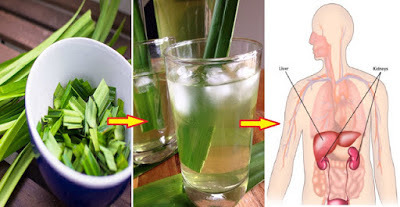 MUST READ: Recipe For Using Pandan Leaves to Get Rid of Toxins From Liver and Kidney! Commonly used as food flavoring because of it aromatic smell, pandan leaves, also known as screwpine, is a tropical plant of in the Pandanus genus and is widely used in South Asian and Southeast Asian cooking. 2.Once the water is boiling, add the ingredients above except the palm sugar. 3. Bring the ingredients to a boil as you adjust the heat to medium. Do this for 10 minutes. 4.Pour the liquid into a glass or a cup. 5.Finally, add the sugar. Let it cool and you can drink after.